Giovane Elber was the Bundesliga's top scorer in the 2002/03 season with 21 goals for FC Bayern München. 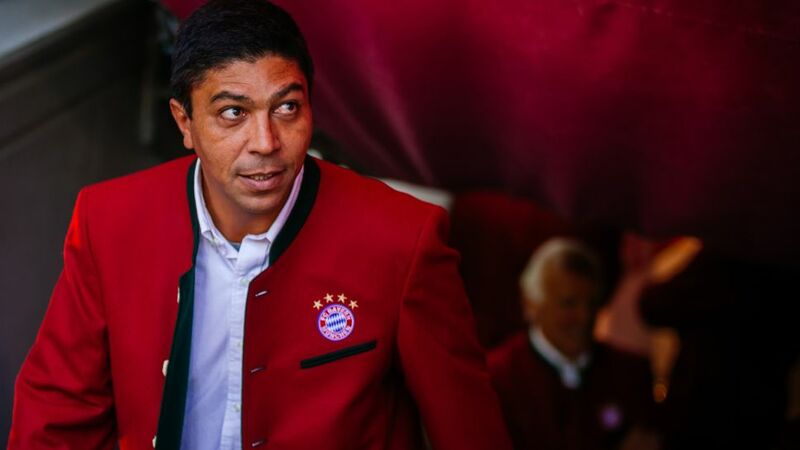 Former FC Bayern München star Giovane Elber may spend most of his time in his native Brazil, but he still keeps a keen eye on the Bundesliga with regular trips back to Germany. In this exclusive interview with bundesliga.com, the former Bayern striker, who also turned out for VfB Stuttgart and Borussia Mönchengladbach, spoke about this year's race for the Torjägerkanone. The 44-year-old also revealed why Pierre-Emerick Aubameyang inspires him and assessed the Bundesliga's best strikers against those across Europe. Update your Official Fantasy Bundesliga goalscoring options during the international break! Bundesliga.com: Giovane, how do you rate the top-goalscorer race in this first third of the season? Giovane Elber: It is not just exciting, it's also very impressive when you consider the regularity with which Borussia Dortmund's Pierre-Emerick Aubameyang and 1. FC Köln striker Anthony Modeste are scoring. With both having registered 11 goals after 10 matchdays it is an incredible return and means they already have a four-goal advantage over their nearest rivals. Bundesliga.com: In the five major leagues across Europe, only Paris Saint-Germain's Edison Cavani has scored as many goals as Modeste and Aubameyang. Can a Bundesliga striker win the European Golden Shoe this season or will Lionel Messi, Cristiano Ronaldo or Luis Suarez once again lead the way? Elber: It is still very much open. However, I believe that in the end, the players you mentioned will again be there or thereabouts as they have incredible experience and with those crucial games in the spring, they are always there [at the top of the standings]. Bundesliga.com: Are you surprised by Modeste's arguably unexpected achievements so far? Elber: I certainly am. Although he scored goals at TSG 1899 Hoffenheim and then at Köln, he still did not have the amount of self-confidence that has characterised him over these past weeks. He seems to be in the form of his life. Bundesliga.com: Do you believe the Frenchman can finish as top scorer? Elber: I guess Robert Lewandowski and Aubameyang have the edge as they are playing in teams who are considered better than Köln. Having said that, I believe it will be an open and exciting race right until the end of the season. Bundesliga.com: How do you assess the development of Aubameyang? Elber: First of all, I think it's great that, despite receiving lucrative offers from England and Spain, he has decided on another season with BVB. He seems to adore the club and really enjoys himself in the Bundesliga. He is an added attraction to the Bundesliga. The more that time passes, the stronger and more assured he gets. Bundesliga.com: With seven goals, Lewandowski is lagging behind a little. Are you concerned for him? Elber: No, not at all. After his strong start to the season, he had a phase where he didn't constantly score. However, after competing at EURO 2016 and a short preparation time at his club, it is clear that he is not at 100 per cent in terms of peak fitness. However, he has so much class and talent that he will score at least 20 goals again this season, I have no doubt. Bundesliga.com: Could Hertha Berlin's Vedad Ibisevic, who also has seven goals, have a say in the final outcome? Elber: It's not impossible, but as I said, I would look more to Aubameyang and Lewandowski. Ibisevic has developed very well at Hertha and has the ability to score at any time. Yet, at Hertha, Salomon Kalou, Julian Schieber or Sami Allagui also score goals, meaning they are a team not solely built around the premise of Ibisevic scoring. It's a different scenario to, say, Modeste at Köln. Click here for more FC Bayern München news!